With a 40-year career in the motorcycle business, there's probably not much Scott Moon hasn't seen or been through. The good times, the slim times, and all in between, this seasoned rider has been around the block and then some. Back in 1995, Scott began working with the Thompson family, owners of Eastside Harley-Davidson and later Emerald City Harley-Davidson. By the end of 2014, Moon was ready for a change. 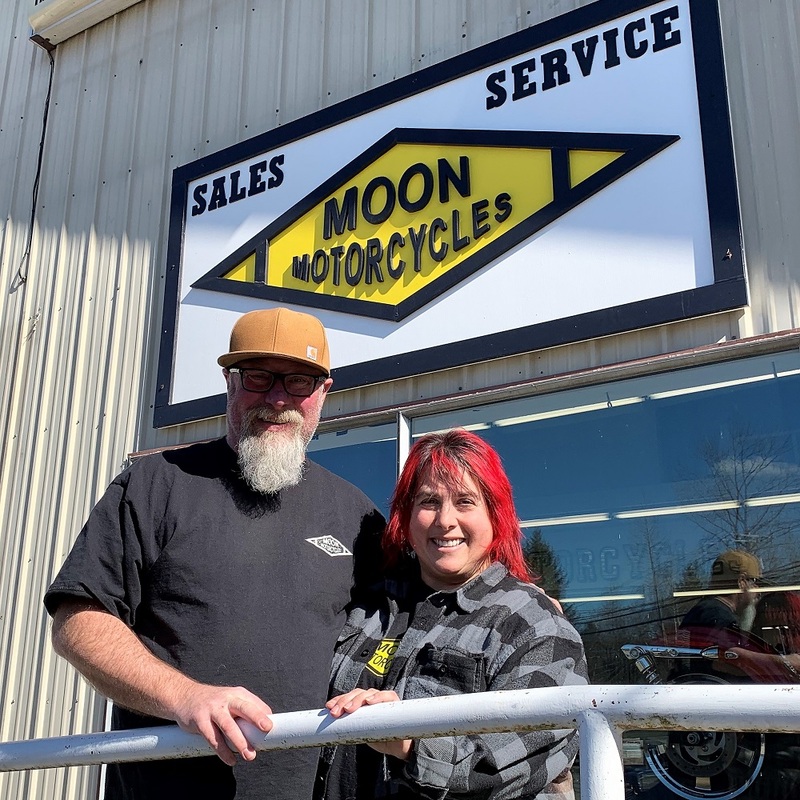 Borrowing from his savings and orchestrating a few full tilt pizza parties, Moon, his wife Leslie, and several friends built-out Moon Motorcycles in Issaquah. It opened in February of 2015. The small used-bike-only dealership has provided quality used bikes to friends both old and new around the Puget Sound since. But time marches on, and in an area where gentrification is the name of the game, the Moon's received word last year the building they occupied on Poplar Way would be torn down and turned into an extension of the nearby office park. Scott and Leslie are some of the most upbeat shop owners in the region today. Whatever way life takes them, they always seem to be at the ready for a challenge, and greeted the notice with positive enthusiasm. Where to move the shop to? Home. Home for the Moon's is 15 miles east of the old shop in North Bend. In January the couple signed a lease on a new location inside the old Chinook Lumber Store in North Bend along Bendigo Way. Making the move in February was a bit of a challenge. Moving day occurred during one of the heaviest snowstorms the region had seen in years. "Nothing like moving 80 motorcycles in three feet of snow," noted Scott. Today the shop has five employees, offers a broad selection of used motorcycles along with independent service for most brands, accessories, and riding gear. While it's still new, the couple has taken a vast collection of old license plates and hung them in cascades from the pillars in the building. A large motorcycle-themed linocut graphic now covers a primary wall, created by Leslie who is a well-known local artist. Expect more unique décor as time continues on. Being so close to home has its advantages. "I used to have to fill the car with gas every week. Now it's more like every three weeks," says Leslie. For the rider, North Bend makes an excellent destination location. Situated between Snoqualmie Falls and Rattlesnake Lake, it's along a prime riding route. And then you could always pop into the nearby Twede's Café for Twin Peaks cherry pie and a "damn fine cup of coffee." Now, with Moon Motorcycles just around the corner, there's one more reason to hit the road.